We’re Moving! TAM® of Nevada Welcomes You to Our New Office in Las Vegas – TAM Card® Nation in Vegas! As of Monday, November 18, TAM® of Nevada will be moving and holding classes in our new and improved office. Don’t worry, we aren’t going far! 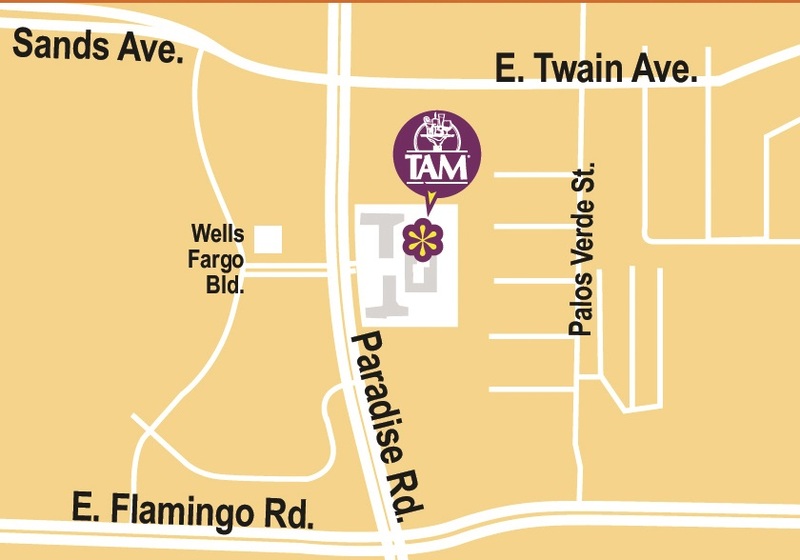 You can find us in the same plaza complex as our current office on Paradise Road, between Flamingo and Twain. Our new address is 3900 Paradise Road, Suite 205, Las Vegas, NV 89169. Our new office space is designed to better accommodate our online TAM® students who need to visit our office for their proctored exams. With separate spaces in the office for our classroom training and proctored exams, and increased space for proctored exams, we’ll be better able to serve our customers quickly and efficiently. To find parking at our new office, drive to the 2-story office building in the Park plaza. Standard and convenient parking for students is available on the side and rear of the building. Handicap parking is available in the rear of the building, and elevator access is available. Parking in the front of the building is limited-time parking only. Our final full business day at our current office is scheduled for Thursday, November 14th. The TAM® of Nevada office will be open for our 9:00am class and morning proctoring only on Friday, November 15th and will be closed on Saturday, November 16th to accommodate the movers. We will re-open for regular business hours and class times at our new office beginning on Monday, November 18th. We look forward to seeing you in person at our new office in the coming weeks, and make sure to visit us on Facebook soon to see photos of our new space! Pingback: It’s Seattle Seahawks vs. Denver Broncos. What Are Your Plans for Super Bowl Sunday? | TAM® Nation in Vegas!